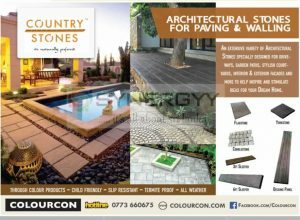 Colourcon brought an extensive variety of Architectural Stones specially designed for driveways. These stones can be use for Garden paths, Stylish courtyards, Interior & exterior facades and more to help inspire and stimulate ideas for your dream home. 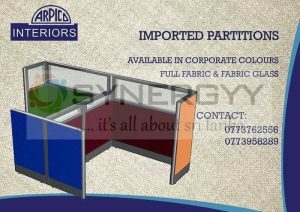 Arpico Interiors brought you a office cabin partitions as your requirement, the partitions comes in your required corporate colours with full fabric & fabric glass. Office Cabin Partitions are help to maintain well discipline in working environment and providing a sufficient working space for the employee to do their job within his or her cabin. Still it’s advisable for parents to adopt this cabin system at home for the kids’ education area with in a given space. So kids learn the discipline and good organising behaviour from childhood. 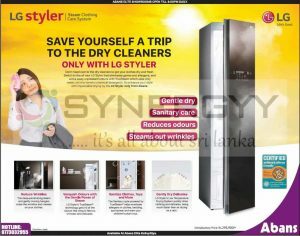 Don’t head over to the dry cleaners to get your clothes dry and fresh Switch to the all new LG Styler that eliminates germs and allergens, and wicks away unpleasant odours with TrueSteam which uses only water, not any harmful chemical detergents So enhance your style with impeccable drying by the LG Styler only from Abans. LG Styler’s TrueSteam technology gets rid of the odours that cling to fabrics, knitwear and delicate. LG Styler’s Low Temperature Drying System quickly dries clothing and delicates. being much faster than air drying on a rack. DSI Samson Group brought you a Sri Lankan Origin Interlocking Gym Floor Tiles for your Gym. 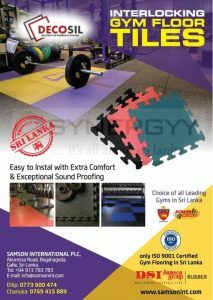 DSI Samson Group is the only ISO 9001 Certified Gym Flooring in Sri Lanka with choice of all leading gyms in Sri Lanka. 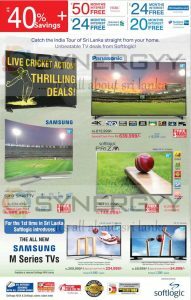 Softlogic is an Authorized dealer for Samsung in Sri Lanka Brought you the Latest Samsung TVs at an special prices for this Seasons. And enjoy special 36 Months Interest Free Instalment scheme along with 35% off. 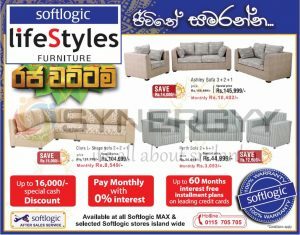 Softlogic lifestyles Furniture brought you a special promotion for the range of furniture for this Avurudu Festive season. Abans announces a special price for LG Semi-Automatic Washing Machine for USD 187 when you arrive to Colombo International Airport at Bandaranayke International Airport. Singer brought you latest 4 in 1 Singer Sewing & Embroidery Machine at an affordable price of Rs. 150,399/-. This model is highly suitable for self-entrepreneur to develop their business with range of features as below. Abans brought you an special promotion for Haier Free Standing Cooker for USD 235 at Abans Duty Free shop at Arrival lounge of Colombo BIA Airport. Contact to Amil Prasanna 077 793 0960 / Danushka Piyumal 07S 933 3217 for more details about the duty free prices and goods availability. 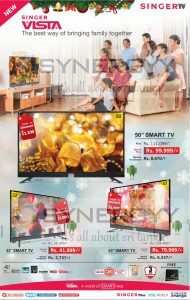 Singer Sri Lanka brought you a special promotion for Singer Smart TV at an affordable price from Rs. 41,999/- upwards. The above Monthly instalment schemes are applicable for Sampath Bank Credit Card Holders for 20 month interest free intallments. 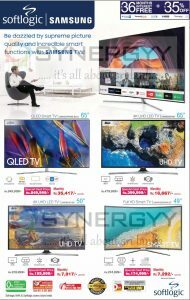 And the Smart TV covers 3 Year Warranty and you will get FREE Dialog 4G LTE Broadband router. No longer worry about forgetting to do your laundry after you head out the door. 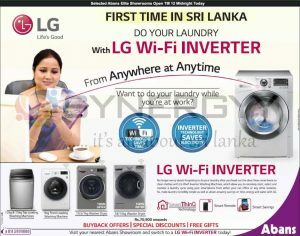 Now come home to clean clothes with LG wi-fi Inverter Washing Machines, which allow you to remotely start, select and monitor a laundry cycle using your smartphone from either your car, office or any other location. So, make laundry incredibly simple as well as attain amazing savings on time, energy and water with LG. 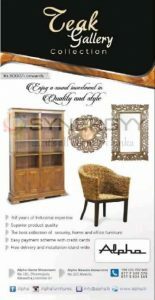 Abans introduce their new company of Abans Homes inStyle for the home luxury furniture and fittings at a special price. 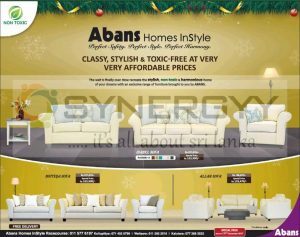 Abans Homes inStyle brought you a now recreate the stylish, non-toxic & harmonious home of your dreams with an exclusive range of furniture as below price. 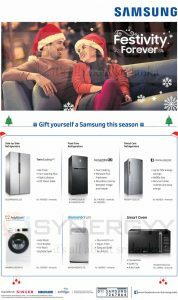 Samsung Sri Lanka brought you a seasonal sale for Samsung Home Appliances at a special price. 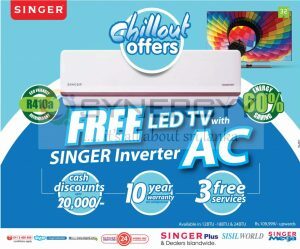 Singer Sri Lanka brought you a special promotion as buy Singer Inverter Air Conditions and get Free 32” TV. 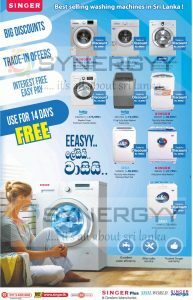 The offer valid for any purchases of Singer 12BTU, Singer 18BTU, Singer 24BTU for Rs. 109,999/- upwards. 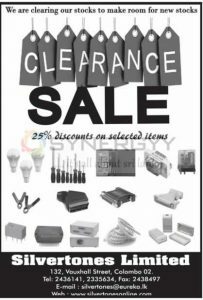 Other than above offers, enjoy Cash Discount upto Rs. 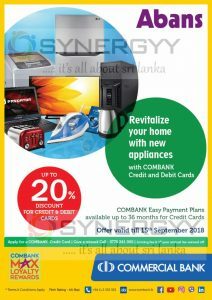 20,000/-, 10 Years Warranty on Compressor and 3 free service. 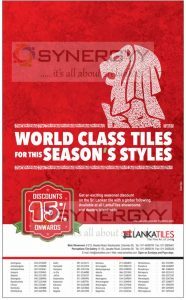 Get an exciting seasonal discount of 15 % off on the Sri Lankan tile with a global following. Available at all LankaTiles showrooms and dealers island wide. The offer available till stock at last. 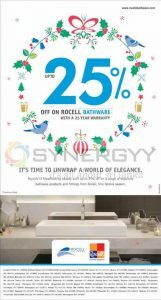 Rocell Announces a special promotion of discount up to 25% on Rocell bath ware with a 25 years warranty on this festive season. Rejoice in breathtaking beauty with up to 25% off on a range of exquisite bath ware products and fittings from rocell in this festive season, take this opportunity if you interested to upgrade your bathroom with range of latest bathware. Are you looking for Lunch Sheets? 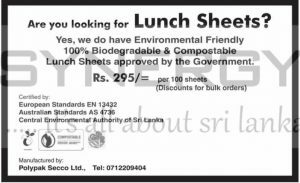 Yes, we do have Environmental Friendly 100% Biodegradable & Compostable Lunch Sheets approved by the Government. 1 Year Comprehensive warranty and 10 year warranty on the compressor. 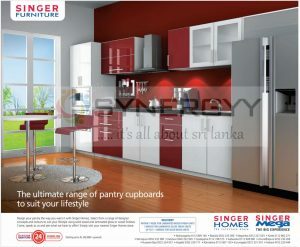 Singer Furniture brought you the ultimate range of pantry cupboards to suit your lifestyle. Design your pantry the way you want it with Singer Homes. Select from a range of designer concepts and colours to suit your lifestyle using solid wood and laminated gloss or wood finishes. Come, speak to us and see what we have to offer! Simply visit your nearest Singer Homes store. 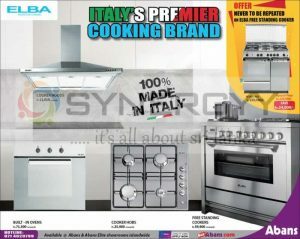 Abans brought you a Italy’s leading cooking and kitchen appliances of ELBA to Sri Lanka. 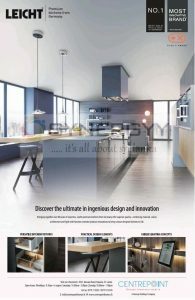 Enjoy range of special prices for ELBA Cooker Hoods, Cooker Hobs, Build in ovens and free standing cookers. Alpha brought you a exclusive experience on Alpha Teak Gallery Collection to enjoy a sound investment in quality and style home at an affordable price of Rs. 8,000/- Upwards. Discover the ultimate in ingenious design and innovation. Bringing together over 80 years of expertise, Leicht premium kitchens from Germany offer superior quality – combining material, colour, architecture and light with function oriented product innovations to bring unique designer kitchens to life by Centrepoint. 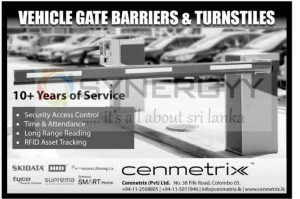 For more details see below image or visit centrepoint showroom, 305C, Nawala Road, Nawala, Sri Lanka. 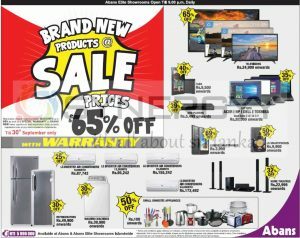 Abans announces a special promotion for the brand new products at a discount upto 65% as well as a special warranty on the brand new home appliances and electronic from globally reputed brands at any Abans showroom island wide. 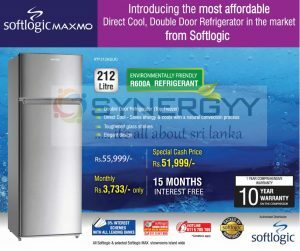 Softloic announces a special promotion for the softlogic, Samsung and Panasonic TV upto 40% off and upto 50 Months Interest Free Instalments.